This old pub was situated on Cathedral Street near Buchanan Street. There has been a public house on this site since 1851. The first licensee was William Robertson who became a popular wine & spirit merchant in the area. 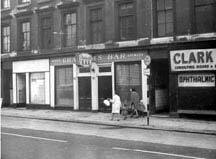 Mr Robertson also owned pubs at 7-9 West Nile Street, 299 Argyle Street. He lived with his family first at nearby Stirling's Road before moving to better accommodation in Sauchiehall Street. William Robertson continued to serve the locals in Townhead until 1862. The next licensee was Robert Robin junior. The Robin family continued in this public house until 1875. George Robin took over the pub in 1868 until his death in 1870, his wife then took over until 1874. Alexander Graham traded from this very old pub in the 1880s, he also owned pubs in Argyle Street, Oxford Street and Crown Street. Mr Graham was president of the Scottish Wine and Spirit Merchants and Beer Trades Benevolent Institution in 1891, he was regarded as a straightforward type of Scotsman, bluff in his manner, but underneath the exterior as true as steel and as solid as gold. He was born in Largs and came to Glasgow in 1865, he acquired licence's for premises in Oxford Street and Crown Street before venturing out into the city centre. To read more on Mr Graham click here Jack Diamonds. At the beginning of the 1900 John McAulay was running the business as one of the trustees of Alexander Graham, which included both premises at Cathedral Street and Argyle Street. In 1910 William Wingate was running the pubs which included his own premises at 142 Houston Street which sat at the corner of Ardgowan Street. After the first World War, Thomas Waugh Lang took control of the business and traded under the title of Alexander Graham. Before the second World War Thomas Waugh Lang, of Lang Brothers Ltd, was licensee. The Lang Brothers consisted of, Alexander Lang, William G Lang, Thomas Lang, Alex & William Galloway Lang, having premises at 128-30 Broomielaw. Hugh Lang 1803 in Eaglesham, Hugh and his sons founded a Company Lang Bros. In 1876 they bought Glengoyne distillery. Robert Stuart Lang was the last licesee of Graham's Bar. Back to Scottish Licensed Trade Association. 1902 John McAulay (for Alexander Graham's trustees).